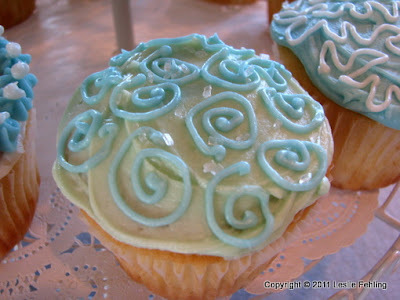 I've been totally immersed in planning our daughter Sara's baby shower the past few weeks. 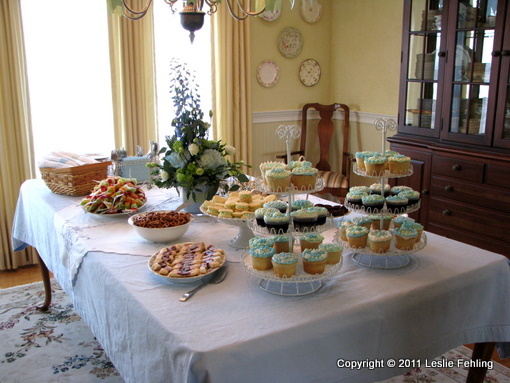 I've had so much fun making the decorations, choosing recipes, and coming up with ideas that would make it a fun and happy occasion for everyone attending. I plan to do a week's worth of blog posts about our little event, since I know most of you will love seeing all the details. Some of my guy readers may want to tune out this week - I'm warning you, this will be very girl-y! 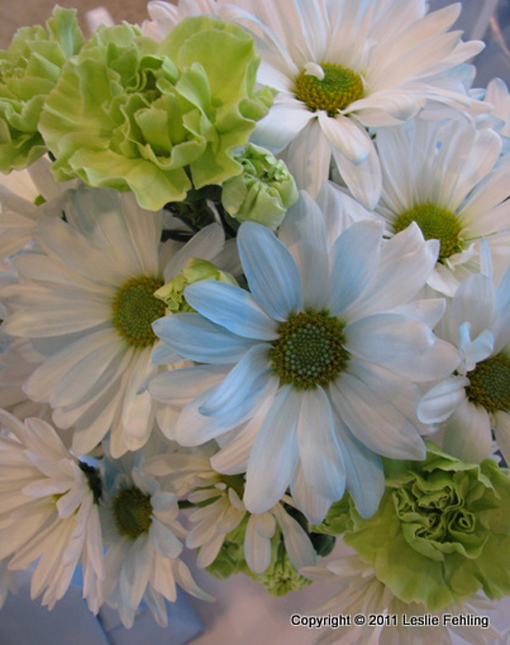 Since Sara has chosen blue and green as her nursery colors, I went with that for the baby shower colors, too. Luckily, my living room and dining room are decorated in the same colors, so I had the perfect backdrop for the party. I spent a few hours online, searching for baby shower ideas, but found very little to inspire me. 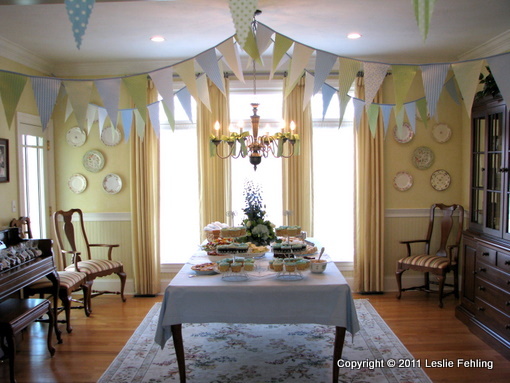 I wanted something sweet and cute, but not typical, and was having a hard time finding it until I came across the Domestic Fashionista blog and saw her adorable party banners. I loved the idea, but gave it my own touch by using a variety of patterned fabrics rather than paper. Yay! I finally had a theme/motif that I could build the rest of the decorations around! 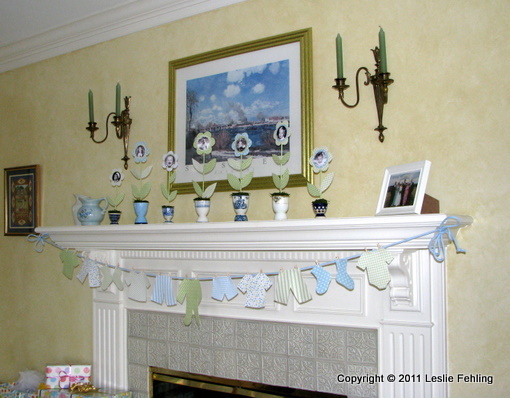 The pennants strung across the living room had blue circles with letters spelling out "BUNDLE OF JOY" and "SWEET BABY BOY". It gave the rooms such a festive, party feel! 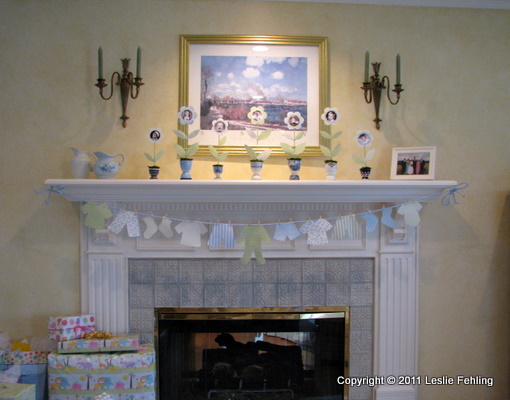 I decorated the fireplace area with a line of baby clothes cut from the same fabric as the banners, and displayed baby pictures of Sara and her husband, Ian, on the mantel. I made covered cord for the clothesline and hung the baby clothes with tiny clothespins that I found at a crafts store. 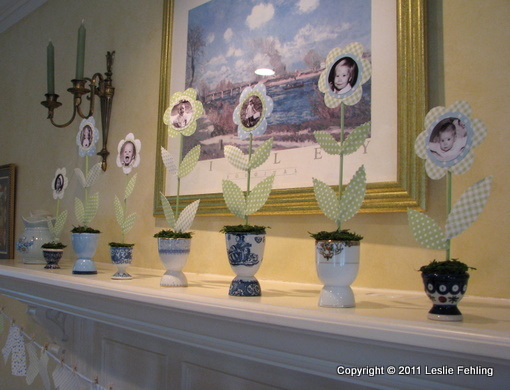 For the baby picture display, I used all the blue cups from my egg cup collection and cut floral foam to fit inside. I painted wooden skewers green, then hot glued on fabric leaves cut from the remnants of the pennants. (Since the fabric leaves were a little floppy, I hot glued toothpicks to the backs to stiffen them.) I know, I know, by this time you're thinking "Leslie has gone way over the top this time!" 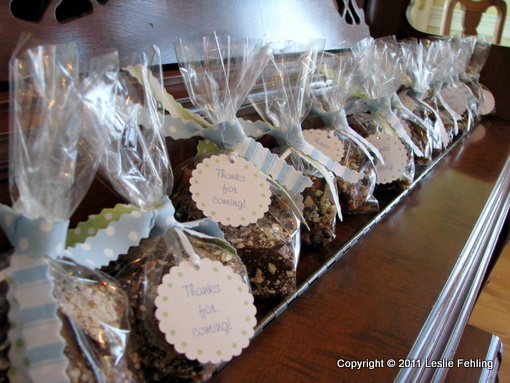 But just look how cute everything turned out! Black and white photos were cut into 2" circles and adhered with double stick tape to the flower centers, which were then hot glued to the top of the stems. 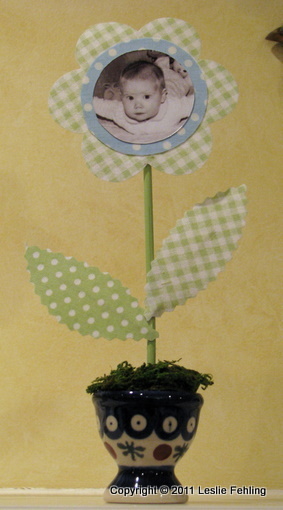 Preserved moss covers the floral foam and adds a finished look to the diminutive flower pots. The living room coffee table was covered with a pretty vintage table cloth and held a display of wrapped prizes and an antique pitcher filled with flowers. 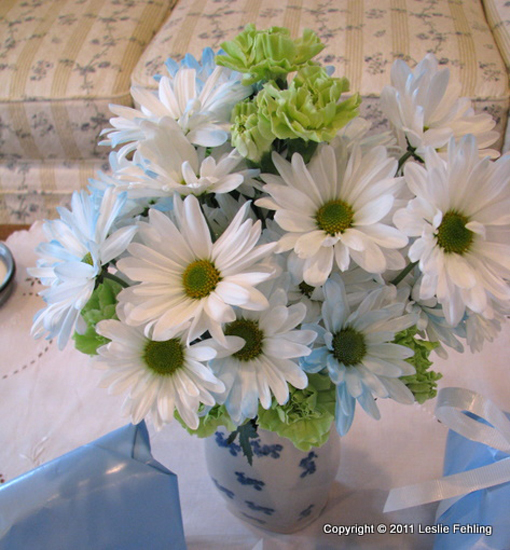 In the dining room, I layered another blue and white cutwork tablecloth over a solid blue one. Why use only one when it looks prettier with two? 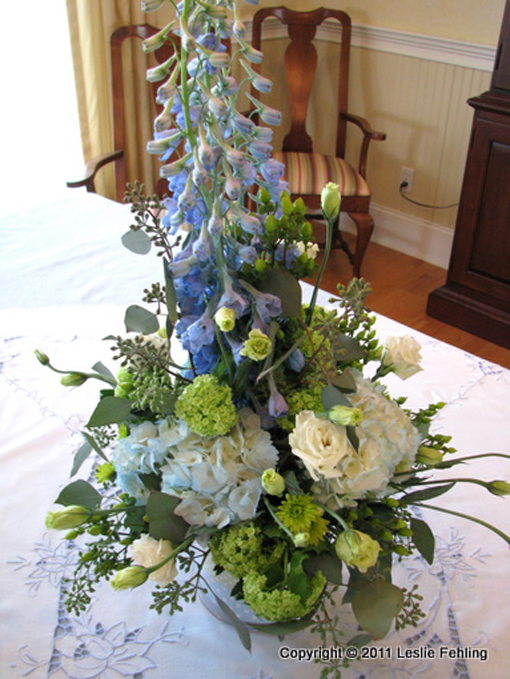 The centerpiece was a beautiful medley of blue delphinium, white roses, pale blue hydrangeas, and assorted green flowers and fillers. 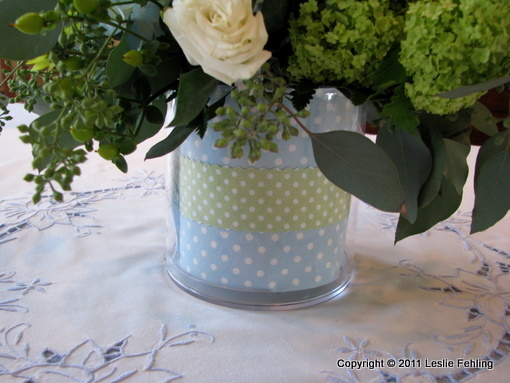 The vase was customized to coordinate with the fabric decorations. 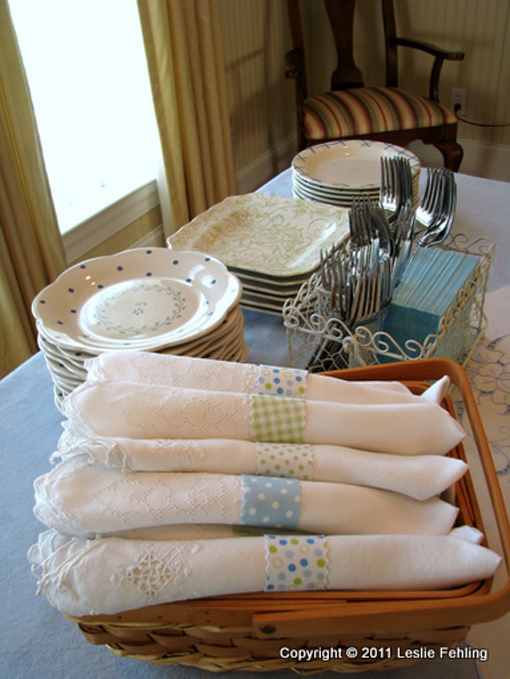 For dishes, I used my everyday Pfalzgraff Cloverhill plates, which just happen to coordinate perfectly with the shower theme colors. 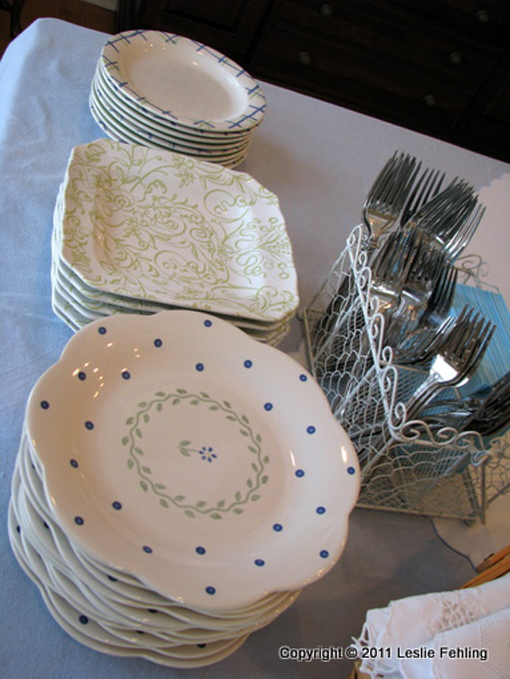 The green floral square plates were a great find from TJ Maxx. 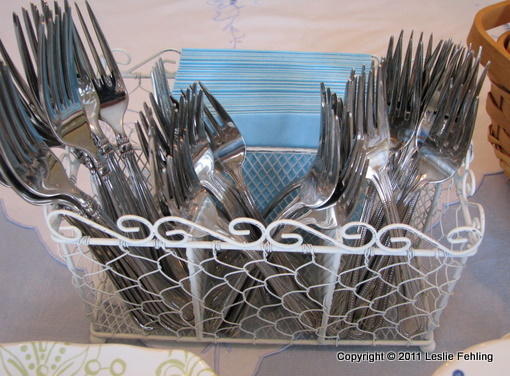 I've looked for a silverware caddy for years and finally found a shabby chic one from Worldmarket.com that coordinates with all my dishes and vintage linens. 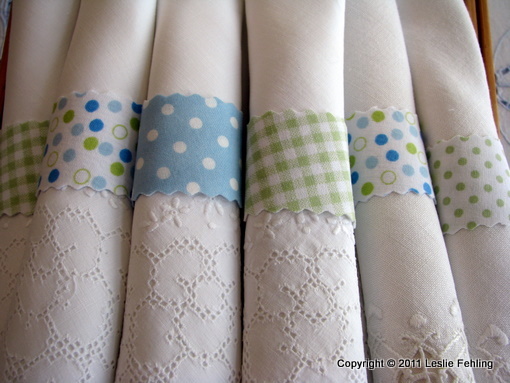 I raided my stash of flea market linens and gathered a bunch of pretty embroidered cutwork napkins to use. Each one was given its own fabric napkin ring. 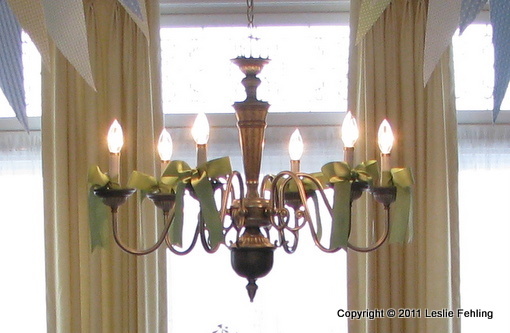 Even the chandelier was decked out for the occasion. 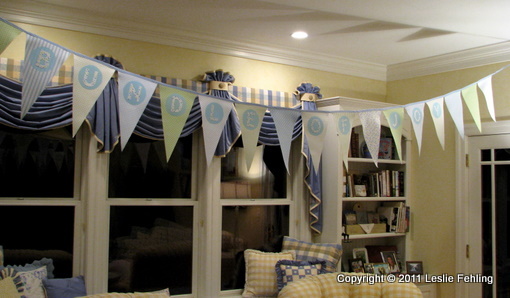 The shades were replaced with grosgrain ribbon bows. We had a full house for the party. 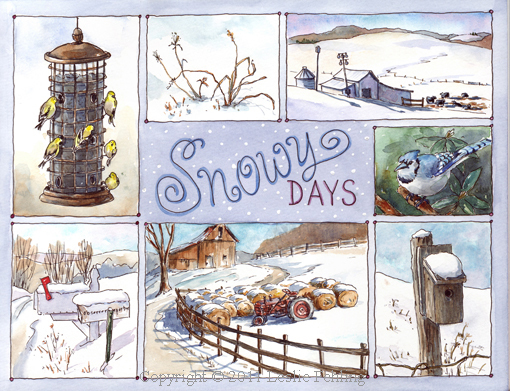 I had been hoping for weeks that we wouldn't have a late-February blizzard, and fortune smiled upon us - it was a gorgeous sunny day. How lucky was that!? Doesn't it just make everything nicer when the sun is shining? The glider rocker she's sitting in was refinished by her dad, and I made the soft cotton chenille cushion covers. 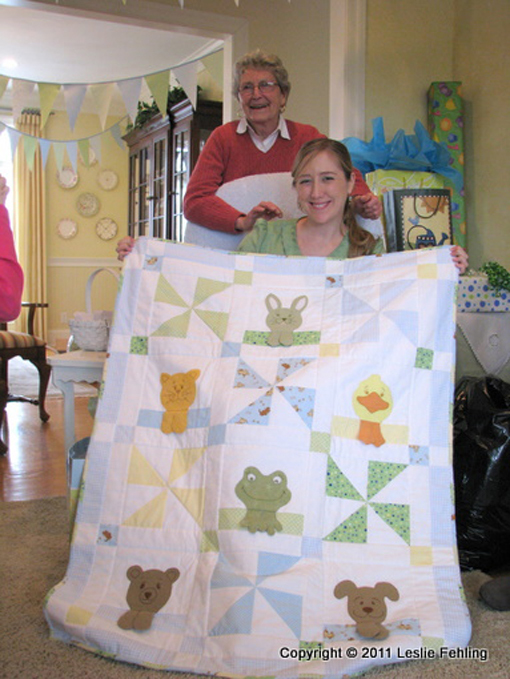 Grandma Saundra made the cutest baby quilt! The appliqued animals have three-dimensional paws/feet, and it's all made of soft, snuggly flannel. 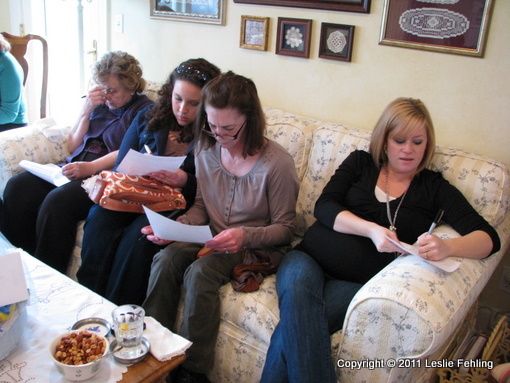 The baby shower games were challenging, but the prizes made it all worthwhile - if you were the one who was lucky enough to win! Everyone from 80 year old grandmothers to 4 year old cousins joined in the fun. 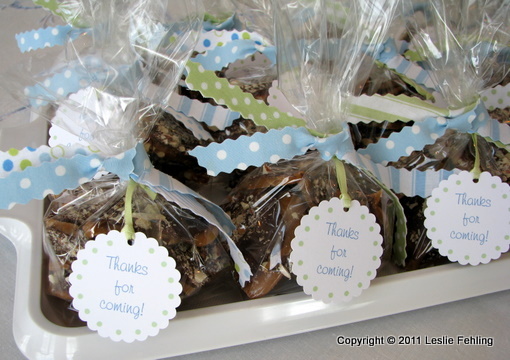 As a take-home favor, each guest was given a bag of my homemade toffee to enjoy on the way home. 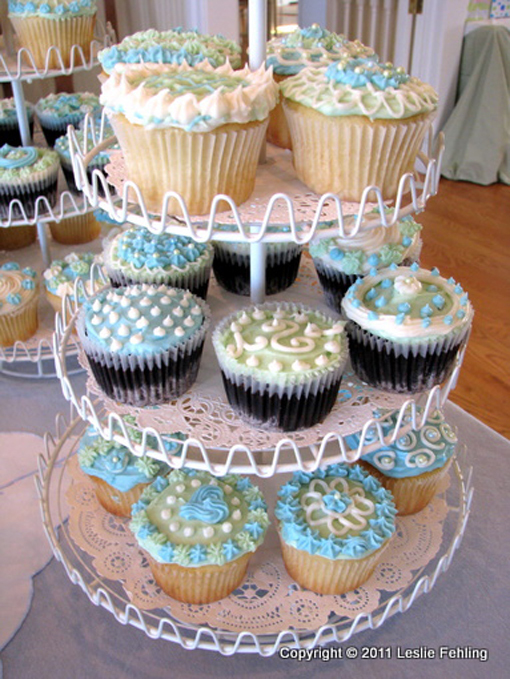 Tomorrow I'll be telling you all about the yummy food I served at the shower. Be prepared for some great recipes coming up! - Lay out a large piece of fabric wrong side up. - Lay Wonder Under on top of fabric, paper side up. - Peel away the paper layer. 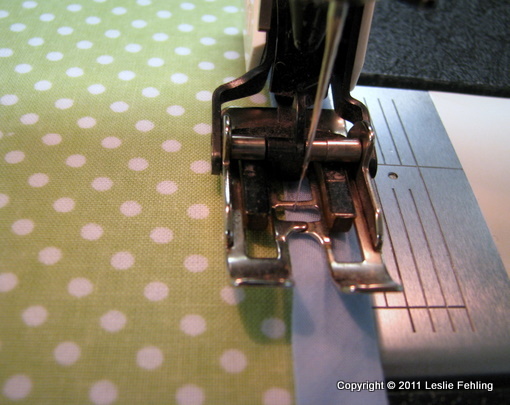 - Lay another piece of fabric on top of the fusible and smooth it carefully. - Iron thoroughly to bond all three layers together. 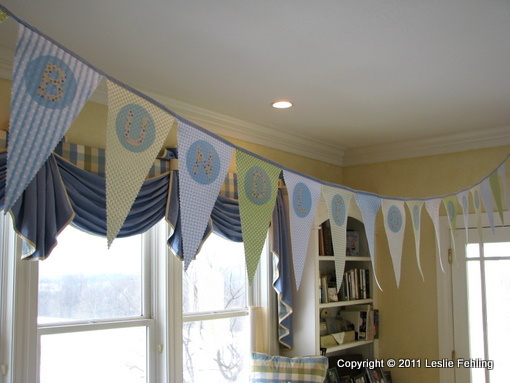 - Decide on the size of your pennants. - For wavy lines, use a pinking blade in a rotary cutter to cut on marked lines. 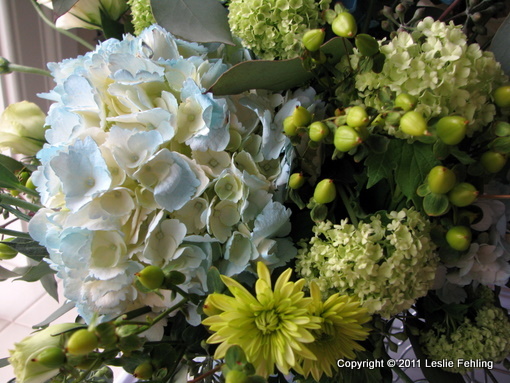 For straight lines, use a regular rotary cutter blade or scissors. - Decide on the finished length of your banners. Allow extra at the ends for tying or fastening. 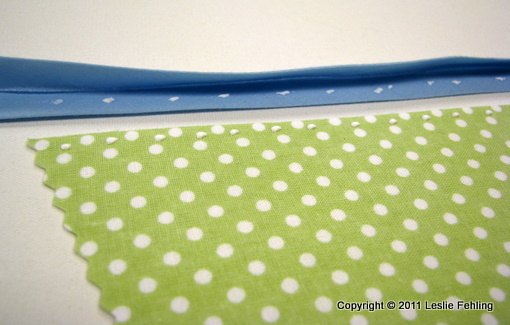 - Make or buy double fold bias tape. 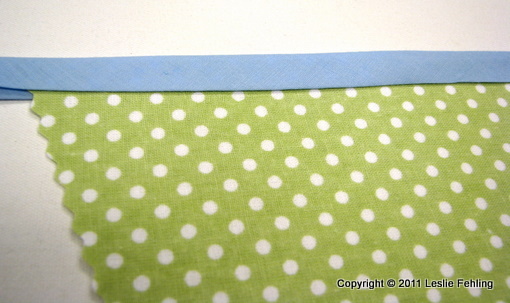 My strips were cut 2" wide to give a finished 1/2" bias tape. - Dot glue along top edge of pennants. 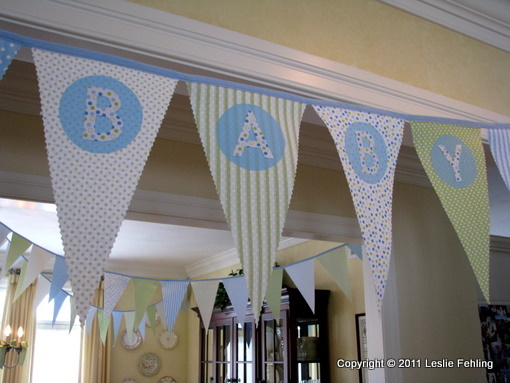 - Place pennants on bias tape and fold down the bias to enclose the pennants. - Allow glue to dry. Press with a warm iron to speed up the drying process. - Machine stitch along the edge of the bias to hold the pennants in place. - Trace circles onto paper side of Wonder Under. - Fuse Wonder Under to wrong side of fabric. - Cut out circles on marked lines. - Peel away paper and fuse fabric circle to pennant. - Print out lettering in the desired size on paper, using a computer and printer. - Trace each letter MIRROR IMAGE onto Wonder Under. - Cut out letters on traced lines. - Peel away paper and fuse fabric letters in the center of the circles. I can't say enough about how delicious this soup is! The complex flavors of mushrooms, dill, paprika, soy sauce, and a surprising hint of lemon combine to make one fantastic soup. When I took my first taste of it, a big smile spread across my face, and I thought, "This one's a keeper!" It's so good - really rich with flavor and loaded with good-for-you vegetables. 1. Melt the butter in a large pot over medium heat. Saute the carrots and onions in the butter for 5 minutes. Add the mushrooms and saute for 5 more minutes. Stir in the dill, paprika, soy sauce and broth. Reduce heat to low, cover, and simmer for 15 minutes. 2. In a separate small bowl, whisk the milk and flour together. Pour this into the soup and stir well to blend. Cover and simmer for 15 more minutes, stirring occasionally. 3. Finally, stir in the salt, ground black pepper, lemon juice, parsley and sour cream. Mix together and allow to heat through over low heat, about 3 to 5 minutes. Do not boil. Serve immediately. 1- I like to use a combination of 8 oz. portabella mushrooms and 8 oz. button mushrooms. 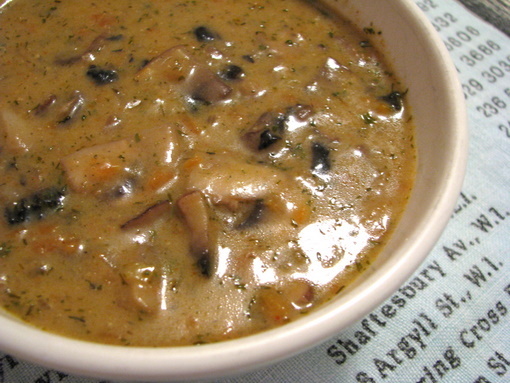 The portabellas cook up firmer than the buttons and give the soup a nice texture. 2- Adjust the amount of flour according to how thick you like your soup. 3- If you have an Aldi store in your area, they always have a good price on portabella mushrooms - much less expensive than other grocery stores. 4- This soup is wonderful even without the sour cream, so, if you're cutting down on fat, just leave it out. 5- I've used leftovers of this soup as a sauce over pasta. It's also good served over a wild rice blend, or with rice simply added to the soup. It's been a hard winter so far, and it's not over by a long shot, but instead of complaining about it, I try to see the beauty in these stark, cold days with their deep purple shadows and cobalt blue skies. Even on the gray days, the contrast of a maple tree silhouetted against a snowy field just gives me a little jolt of happiness. Standing at my kitchen sink, I have a great view of this birdfeeder just outside the window. The goldfinches, chickadees, cardinals, bluejays, and sparrows keep me entertained with their ongoing competition to see who can consume the most sunflower seeds in the shortest amount of time. 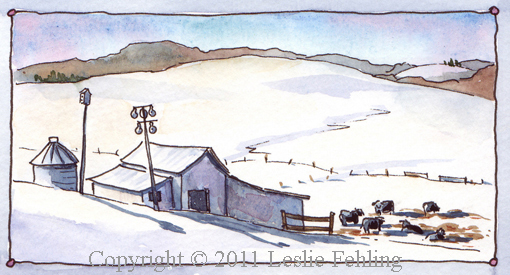 Here's a farm along Neff Road, near the town of Dry Tavern. 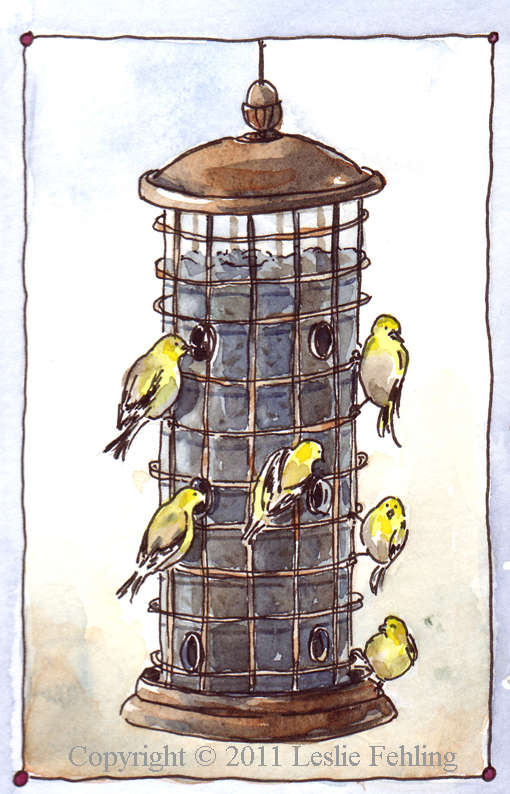 See the gourd birdhouses hanging from the pole, waiting for the return of the purple martins in the spring? The cows were enjoying the sunshine the day I stopped by. The winter weather doesn't seem to phase them a bit. 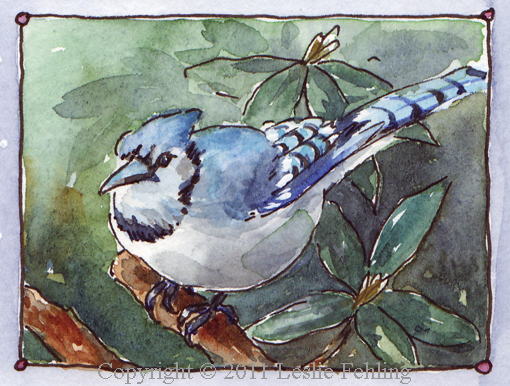 Blue jays are such hogs at a bird feeder. They chase away the smaller birds and just generally make a nuisance of themselves. But they're so pretty! I love watching them. That blue color is just dreamy. 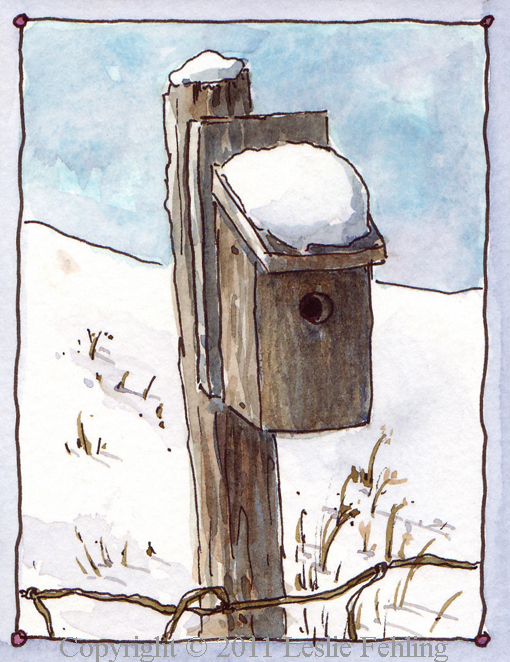 We have several bluebird houses around our property, and I always get so excited when I see the first occupants arrive in the spring. 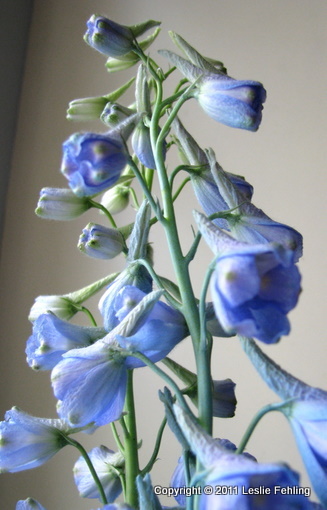 By June I'm usually a lot less enamored of them, however, because they go crazy over the ripe blueberries in my garden! Years ago, when I discovered that the reason I wasn't getting any blueberries was because of the hoards of bluebirds dive-bombing the bushes, my brother-in-law drawled, "Well, Leslie, why do you think those bluebirds are so blue?" Very funny, Bob. This is my favorite of the scenes on this page. 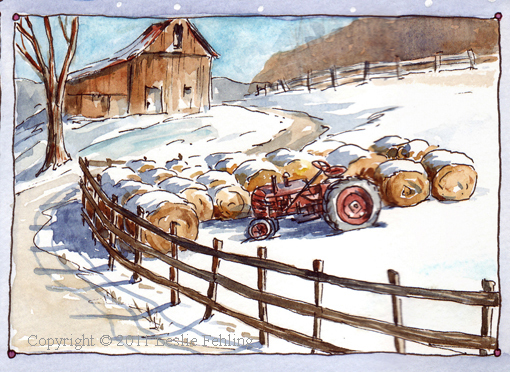 Love the shadows on the haybales. 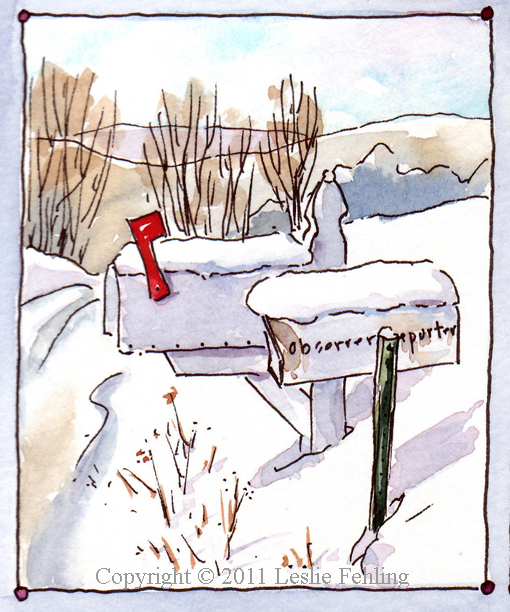 Our mailbox is out at the end of our driveway, about 1/4 mile from our house, and often Buckley and I take a walk to get the mail after lunch. It gives us a nice midday break. Doesn't the red flag look jaunty? 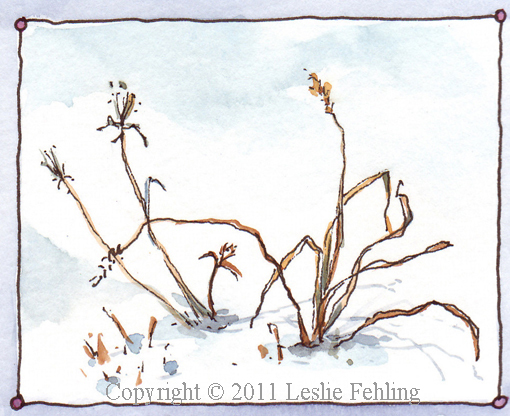 I hope you enjoyed these winter sketches. I'm hoping I'll be dipping into that spring green paint soon! It's baby time in our family! My daughter Sara and two of her cousins are all having babies within weeks of each other this spring. What a happy coincidence! There are lots of delighted grandmas counting down the days - we're all so excited. 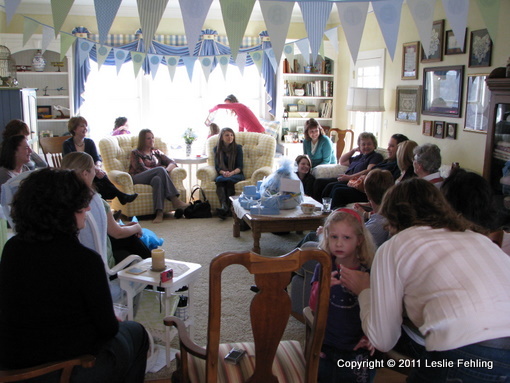 Last weekend we had the first baby shower, for cousin Katie who is expecting a little girl. I made her the most adorable baby quilt - I defy anyone to look at this quilt and not smile! I came across this pattern in the book Sweet Nursery Chic by Susan Cousineau and just fell in love with it. I knew it would coordinate perfectly with the pink, black, and white color scheme that Katie is planning for her baby's nursery. I used flannel, chenille, and polar fleece, in addition to cotton quilting fabrics, to provide a variety of textures for a curious baby. 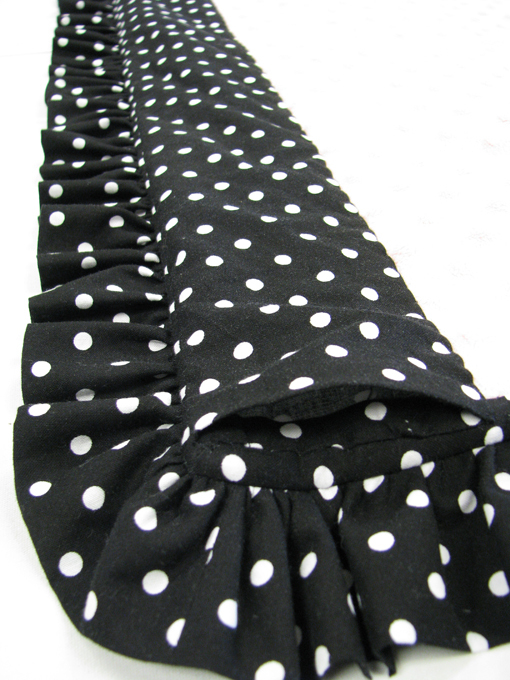 And to make this girly design even cuter, I added a 2" polka dot ruffle all around. 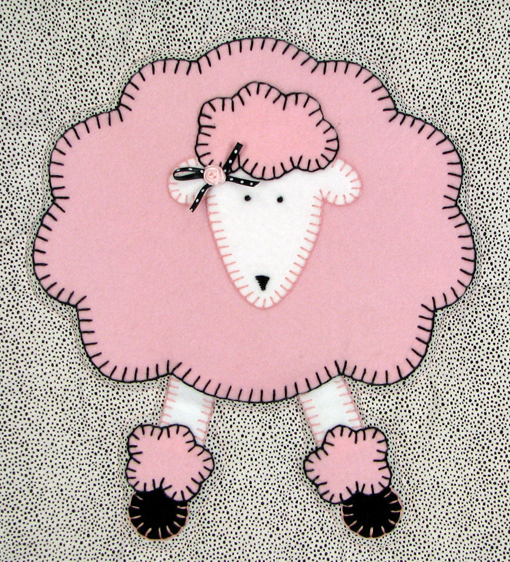 The pink poodles are cut from polar fleece fabric and appliqued using Heat 'n Bond Lite Iron-on Adhesive. 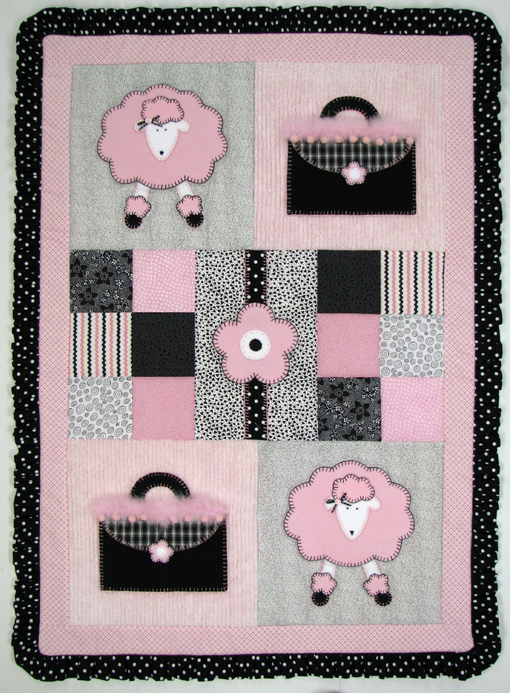 I blanket stitched by hand around all the applique pieces using pink DMC embroidery floss and black perle cotton. 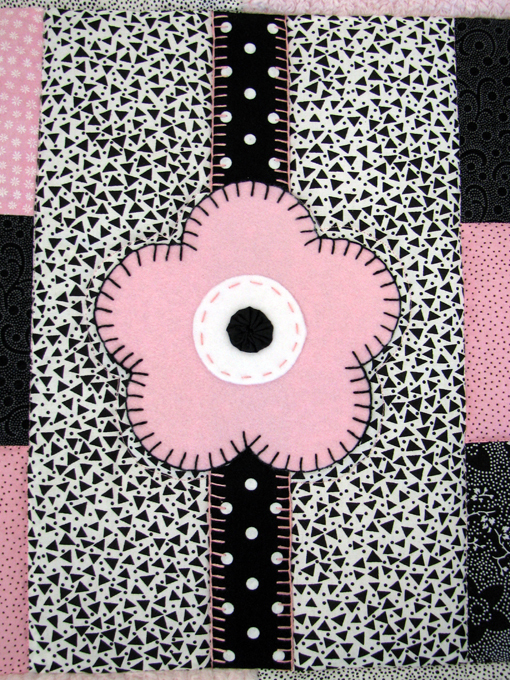 In the center of the quilt, a large polar fleece flower is surrounded by a patchwork of pink and black prints. The original pattern called for the use of decorative buttons for the flower center, poodle noses, and other accents, but I wanted to keep the quilt baby safe, so I substituted a tiny yo-yo for the flower center, and simply used embroidery for the rest. Dense quilting can stiffen a quilt, so I kept the quilting to a minimum, mostly outlining and stitching in-the-ditch, to keep the quilt soft, cuddly, and drapeable. 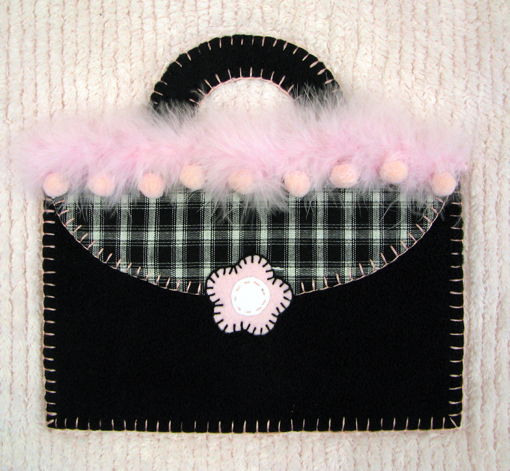 The purses, on a background of pink cotton chenille, are cut from plush polar fleece and embellished with pom-pom fringe and pink feather boa trim. The boa trim is a cute addition to the quilt, but is not washable, so I basted it on, to make it easy to remove. Under the feathers, I used a band of the pink and black ric-rac patterned fabric (shown in the full quilt view) to cover the edge of the pom-pom fringe. So, if the quilt is used as a wall hanging, the feather boa can remain, but if it is used everyday, the feathers can be taken off and the the whole thing will be washable and baby safe. I added a matching hanging sleeve on the back of the quilt, to make it easy for the new parents to simply slip in a drapery rod and mount the quilt on a wall. I always include a label on my quilts. After all, they're works of art, and they should be signed. It adds a nice personal touch, too. 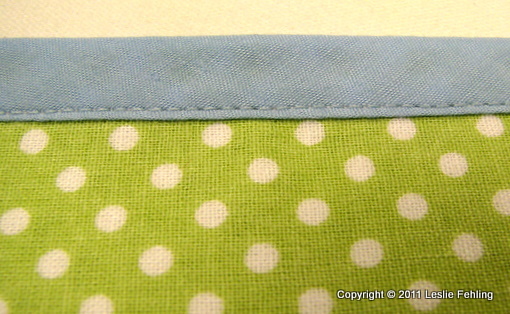 The back of the quilt is pink polka dot Minkee fabric - so soft and cuddly! 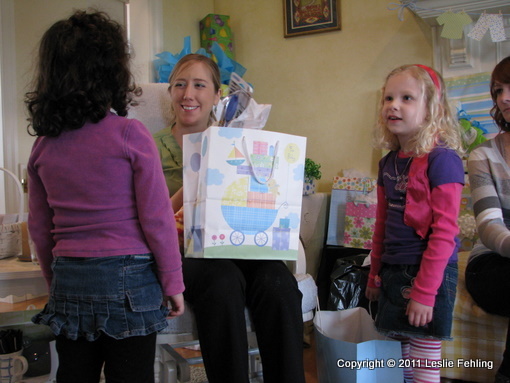 It was so much fun seeing Katie open her gift! The quilt elicited lots of oohs and aahs, as did all the adorable little pink dresses and booties and hair bows she received that day. Baby Laura is going to be quite the fashion plate! With two wonderful parents like Katie and Dan, she's also going to be one happy and well-loved little girl.